Studio Junction transformed a two-story apartment above Mjölk, Juli Daoust and John Baker’s design boutique on Toronto’s busy Dundas Street West, into a tranquil space. A courtyard joins the living room and the open kitchen and dining area. A cherry pot trivet by Oji Masanori hangs from a white-oak kitchen rail by Studio Junction above a custom soapstone counter-top. 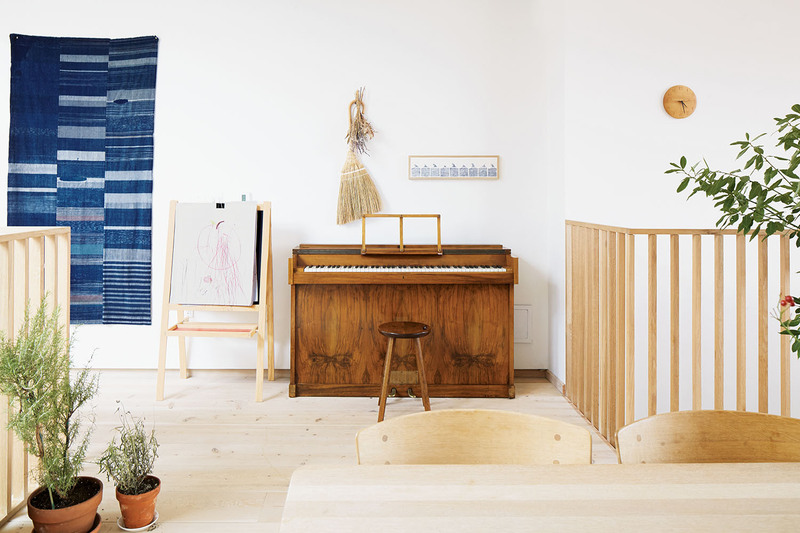 An antique Japanese indigo tapestry hangs by a vintage Danish piano. Many of the items in the home come from Mjölk, on the ground floor of Daoust and Baker’s building, which dates to the 1870s and has a distinctive tin facade. These include the Cesta floor lamp by Miguel Milá and the wall cabinet by Studio Junction in the living room. The photograph hanging above the cabinet is by Joshua Jensen-Nagle. A ceramic dove—a vintage piece by the sculptor Cleo Hartwig—shares space with an antique Zulu beer pot. The painting is by Max Papart. The living room is anchored by a sofa and lounge chair, both by Børge Mogensen, as well as a Conoid bench by George Nakashima. An Isamu Noguchi pendant lamp casts a warm glow onto the Brasilia coffee table, designed by Claesson Koivisto Rune for Swedese. A Japanese hinoki bowl and stool from Mjölk sit next to a custom hinoki bathtub by Bartok Design in the tub room. A copper mobile by JF Jones hangs over a Leander crib and a vintage Moroccan rag rug in the nursery. The rocking chair is by Hans Wegner for Fredericia. The design boutique Mjölk is an unlikely oasis. On a busy road lined with work-worn brick buildings in Toronto’s Junction neighborhood, the shop is a tailored space full of artful Scandinavian and Japanese design: ceramics by Masanobu Ando alongside George Nakashima originals. Its young owners, Juli Daoust and John Baker, built the collection through visits with the makers, selecting cups from kilns in Finland or handmade cutting boards from studios in Tokyo. Over five years, Daoust and Baker worked closely with architects Christine Ho Ping Kong and Peter Tan of Studio Junction to find and purchase the building, design the store, and renovate the apartment. 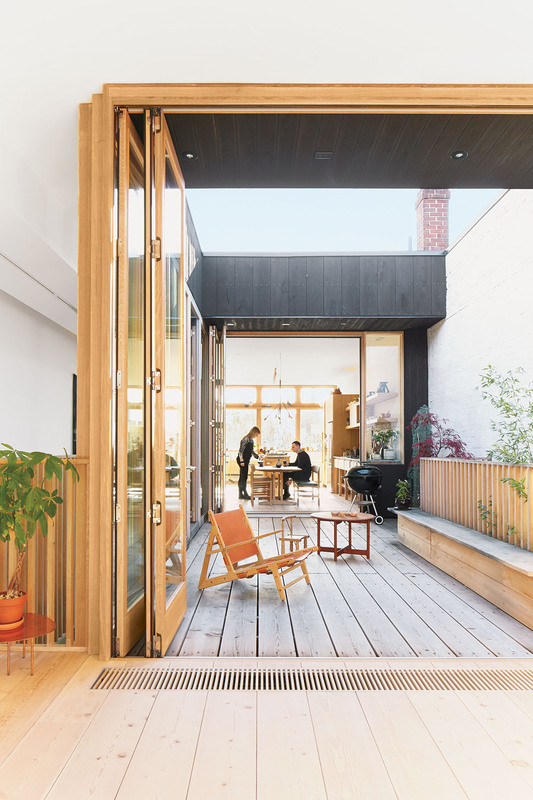 Tan and Ho Ping Kong live and work nearby in a house of their own design, and that place—an unusual building, on a back alley, with a central courtyard and walls of warm, carefully hewn millwork—set a good example for the Daoust-Baker renovation. Studio Junction worked within the 19-foot-wide building to create an apartment that, thanks to a clever layout, offers light and space despite being hemmed in on both sides. Finished with soap-treated Douglas fir floors, handmade oak shelving, and many products from Mjölk’s inventory, the dwelling offers a warm and very Scandinavian getaway from the bustling city. “A lot of people have trouble getting the human side of a home in contemporary buildings, and that’s what we admire most about these guys,” Baker says. That means lots of wood, materials that will acquire a patina over time, and an arrangement of rooms that emphasizes communal living. Ho Ping Kong and Tan worked on the construction themselves with builder Jay Blasdale. Tan did much of the woodwork, including the window frames, the oak bench that sits outside, and the kitchen cabinetry, which resembles the furniture in a Norwegian cottage. The drawer fronts are made of solid white oak, which Tan crafted with old-school through-tenon joints rather than screws or brackets. “It’s about subtlety,” Baker says. “You don’t have to show it off, but, if you look closely, it’s a beautiful detail.” Likewise, the kitchen sink is a soapstone bowl—carved by Tan—that features exposed copper piping, a bit of wabi-sabi that lightens the creamy surfaces of the space. A hanging lamp by Swedish designer Jonas Bohlin, also made of copper piping, provides a high-end counterpoint. Overall, the space is meant to be flexible. “The usage of the place will change with one or two kids,” says Ho Ping Kong, herself a mother of two. On the second floor, the master bedroom, nursery, and children’s room­—which Elodie and the couple’s second child, due in April, eventually will share­—form a string from back to front. Opening shoji-style sliding doors allow for a continuous view through the apartment. The nursery, in the middle of the apartment, borrows light from the courtyard above via a small shaft. The entire effect is efficient and genuinely comfortable.